Thank you to HOOT for sending a Treasure Box for review in exchange for my honest opinion. HOOT stands for Hands On Occupational Therapy. “HOOT promotes purpose driven play with toys & activities to strengthen developmental skills & reach milestones.” HOOT was founded by a mom whose son needed occupational therapy and is led by Lisa, an Occupational Therapist with over 25 years of experience helping babies and children. 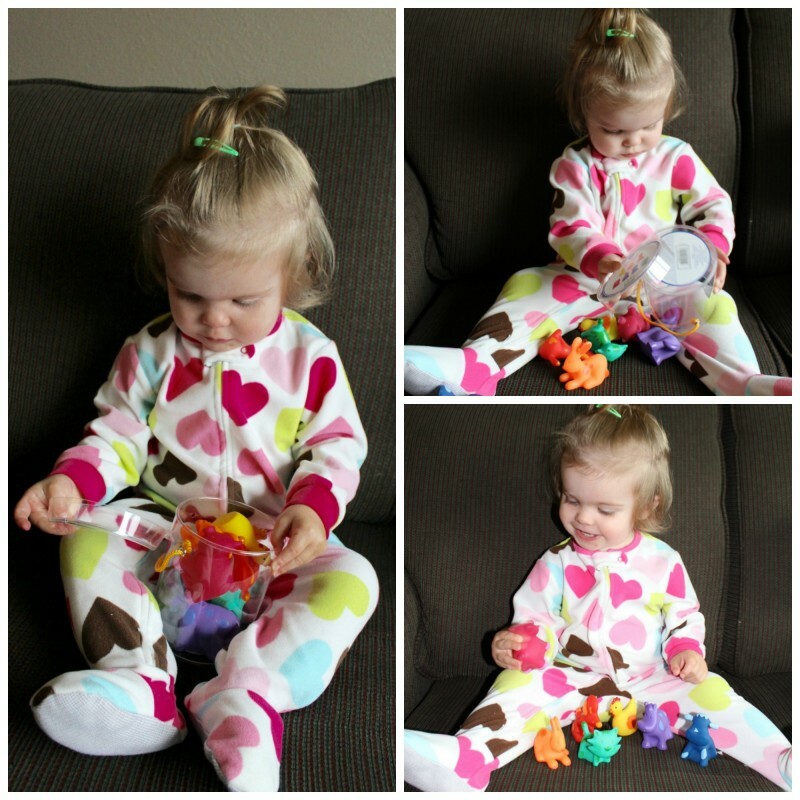 Toys can be used to promote children’s gross motor, fine motor and sensory processing skills. Every child has unique needs, so each HOOT For Kids Treasure Box is custom packed based upon the child’s age and developmental stage. 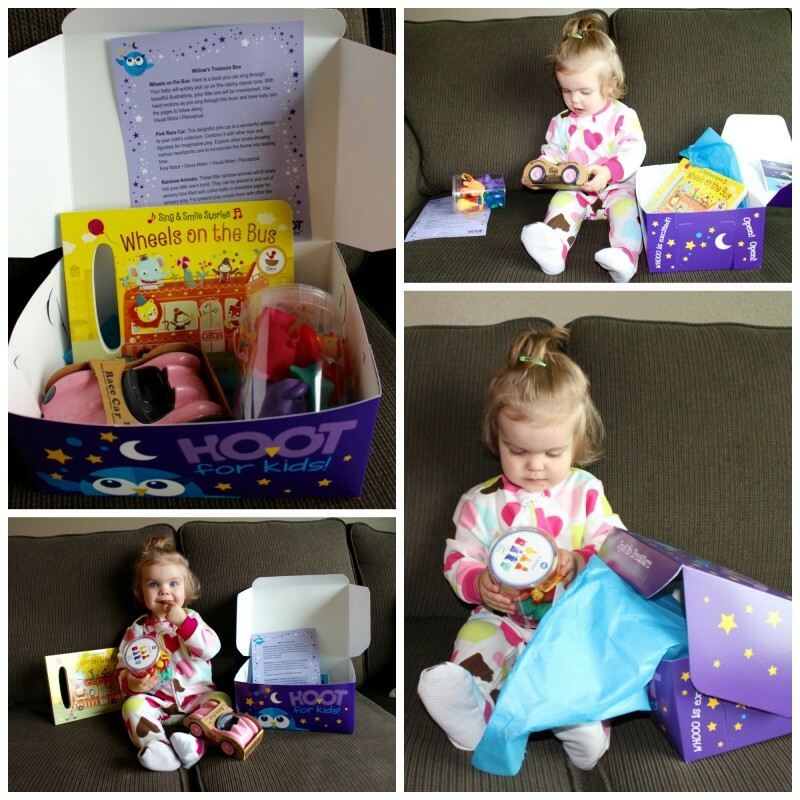 You answer questions about your child’s age and developmental stage on the HOOT website when you order your box. The HOOT Treasure Box arrives packed with at least three toys and a card that describes ways to utilize those toys with fun activities to challenge and stimulate your child. As you can see, our daughter LOVED opening her HOOT Treasure Box. She’s 18 months old now. 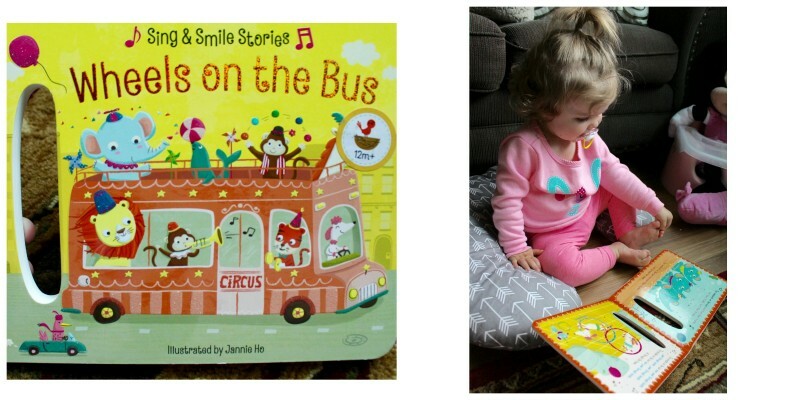 She received a Wheels on the Bus board book, a Pink Race Car and a set of Rainbow Colored Animals. HOOT partners with over 70 brands to bring you top children’s toys and activities. All of the items we received are very nice quality. They also weren’t things I had seen before. I liked that these were items you might not necessarily be able to find at the local store. 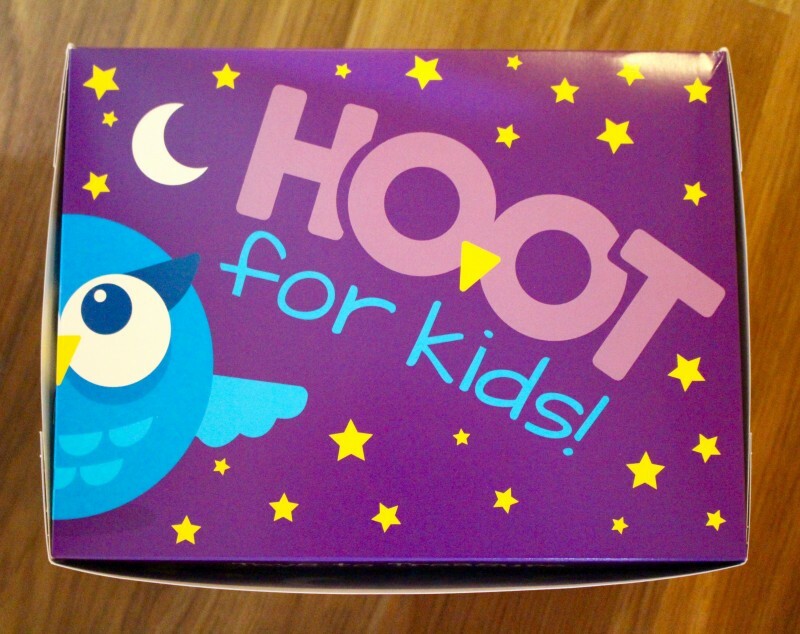 HOOT For Kids Treasure Boxes are made for newborns up to age six. 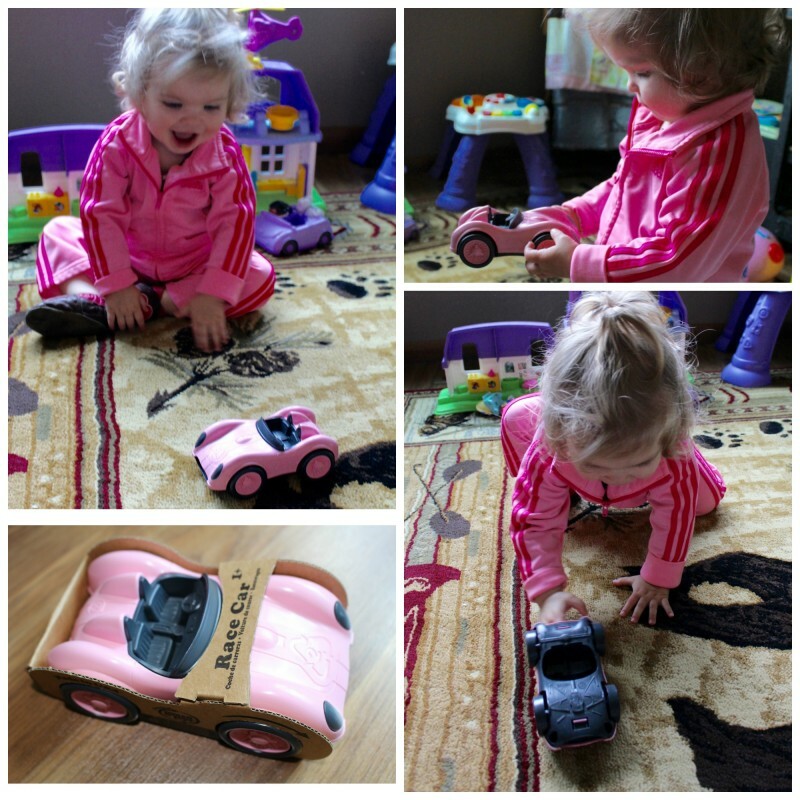 If you are looking for a gift for a child and are stumped on what to buy, these are a fun idea! You can rest assured that they will be tailored for that child’s age and developmental level. For an extra charge there are also add ons available, everything from stuffed animals, to blankets, to bath and feeding accessories, you can choose whatever you like to make the perfect gift. Interested in trying HOOT For Kids? Use the discount code below to get $5 off your first box! Buy It: Head over to HOOT For Kids to see for yourself the great products they offer. Use Code: 5OFFBOX16 to get $5 off your first box! Hurry! Code expires 8/1/17. Connect: Don’t forget to like them on Facebook, follow them on Twitter and Pinterest for all the latest news and promotions. I love the pics of your little Einstein. 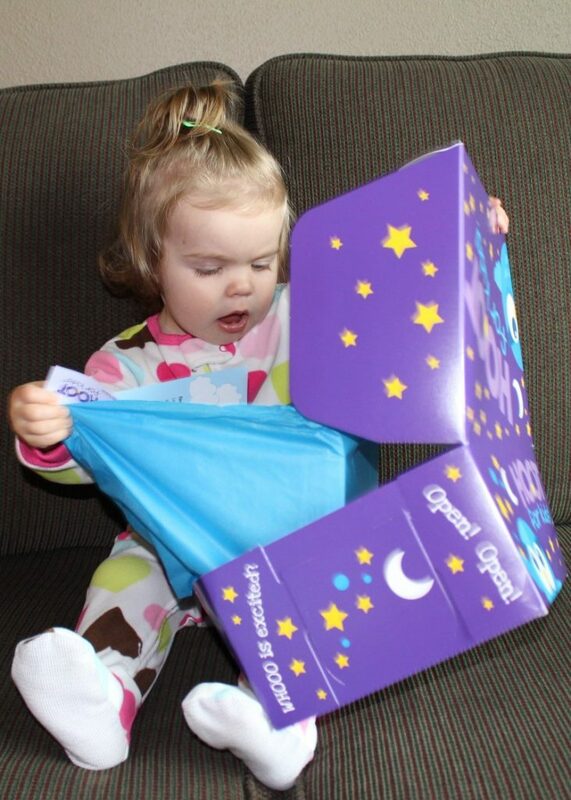 It looks like she’s enjoying her HOOT box immensely! I really like how custom these boxes can be! Sometimes going to the store to find a “new toy” can be overwhelming and this would help with that something new every month. This is such a fun subscription box to get for your little one! 🙂 My baby girl would lover everything that yours recieved. Thank you so much for sharing and for the discount code!